We were approached by a power sector utility boiler and after market services company, offering specialist services and technologies to clients in the nuclear power generation, fossil-fired power generation, oil and gas and petrochemical industries. It is one of only four companies in the world with its own proprietary technology in the field of boiler engineering, whom required a very bespoke pvc strip curtain within one of there heated storage areas. 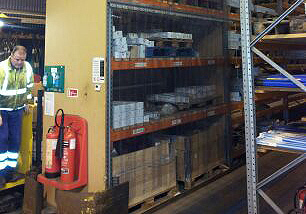 They were storing their welding consumables within a shelving system that was over 6m high. It contained welding coil and rods that had to be kept at a constant temperature to maintain the quality of same and obviously maintain the quality of the final welded products in this high level of quality engineering. The client required continual access 24 hours a day 7 days a week so a simple ease of use system was required due to high levels of useage and maintenance of the heated controlled environment within the section of the storage. We designed, manufactured and installed 3 number simple sliding curtains that could easily slide to the side of each bay by a single man and simple pull cord system, and once the required consumables had been removed could again be slid back into the closed position thus maintaining the controlled heated environment. Each curtain utilised a stainless steel hook on system supported by aluminium track and rollers, thus creating a long life against corrosion and being almost maintenance free, the stripflex curtains sat on top of each other ensuring each area could be isolated to ensure the environmental control and make operation more user friendly. Stripflex plastic PVC strip door curtains can be for internal and external use. External PVC strip curtains for outdoor use are heavier duty with greater overlap and are heavier in weight. Whereas, the internal curtains help to maintain temperatures within the building whether that be commercial or industrial they also reduce noise and are easy to move for access. All of our curtains are low maintenance and easy to install, should you need any replacements strips you can purchase spares aswell.